Did Sanjay Dutt Sleep With Kamli’s Girlfriend In Real Life? It’s unquestionably the biggest movie of Ranbir’s filmy career and has given it a much-needed boost. 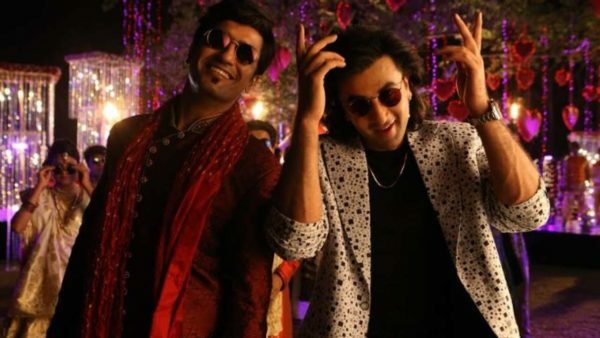 Ranbir has received accolades from fans and critics alike for all the hard-work and dedication that he has put in to give a splendid performance in the biopic. Now fans have higher expectations from the actor and he will need to choose his projects carefully so as not to disappoint viewers. Talking about “Sanju”, it beautifully portrays the emotional bond between father Sunil and son Sanjay. Other than the touching father-son relationship, what moved audience was the pure and selfless friendship of Sanju and Kamli whose character is said to have been inspired by Paresh Ghelani to a large extent. If you have watched the film, you must have been taken aback by the scene in which Sanjay Dutt is shown to have slept with his best friend Kamli’s girlfriend, the character played by Karishma Tanna in the flick. When Paresh Ghelani was asked about the reality of this scene, he gave an answer in “Yes” and revealed that this actually happened. As per Paresh, he never asked about it to Sanjay until he watched “Sanju”; however, this scene in the movie was absolutely real and he was dating a girl. When Paresh was asked whether he stopped talking to Sanjay Dutt after Mumbai blasts, he said that a rift was created in their friendship due to misunderstanding; nevertheless, they used to talk on phone and when Sanjay came out of the jail, he was waiting outside to meet him. Next articleAutorickshaw driver becomes mayor of Pimpri-Chinchwad.